In my interview, years ago, of Sonal Mansingh, outstanding exponent of Bharatanatyam and Odissi (Odishi), I will always remember this one line of hers, ?A dancer is not just a dancer but a part of this environment. The dancer exists in a society wherein its happenings and experiences impact him or her all the time. If the dancer?s art does not reflect the existing milieu, it (the art) will stagnate.? True to every word she uttered, this unique veteran exemplifies this statement in her chosen two streams of Indian classical dance, Bharatanatyam and Odissi. Sonal?s training in Bharatanatyam began with the inimitable Guru Shri. U.S. Krishna Rao in Pandanallur style and Padamashri K.N. Dandayudhapani Pillai of the Karaikkal Sampradaya. One of her early performances in 1962 at the Chennai Kalaivanar Arangam (Children?s Theatre) was conducted by Dandayudhapani Pillai himself. As a young girl of twelve, I watched it along with my father Dr. V. Raghavan, who also happened to be presiding over that event. The performance still remains etched fresh in my memory. Sonal, vibrant and spirited, danced with amazing dexterity to the rigorous nattuvangam of her guru, who was uncompromising and strict. Another mesmerizing presentation was a lecture-demonstration by Sonal along with her illustrious teacher, Guru Kelucharan Mahapatra on the technique of Odissi at the prestigious Music Academy in Chennai. To her goes the credit for making such a presentation which was the first of its kind in the city, bringing the Chennai audience much closer to this art form. In 1974, Sonal met with a horrifying car accident in Germany which broke her fourth lumbar vertebra into smithereens, four ribs and collar bones, and also had to suffer the trauma of German doctors decisively declaring that she would never be able to dance again. With the help of French-Canadian chiropractor, Dr. Pierre Gravel and with fierce determination and faith in God, she proved those German doctors wrong and gave her first post-accident Bharatanatyam performance on May 4, 1975 at the Convention Hall, Ashoka Hotel in Delhi. She has not looked back since but has used her experience to sensitise people about their body, emotions, spirit and the possibility of transcending the greatest obstacles in life. Her story was researched and written up in the Reader's Digest September 1979 issue titled, "I Will Dance Again." This was included in both the English and Hindi syllabi in the government schools of north India for classes eight and nine. Scores of accident-injured, spine-broken patients requested her to visit them in hospital. She referred many to her doctor in Montreal, Canada who were cured by him. Thus Sonal is a true dwija, twice born! 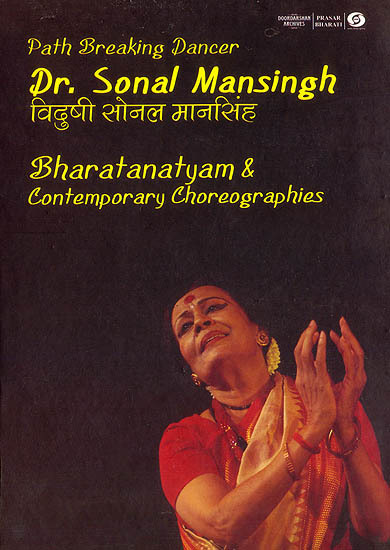 Sonal is a social activist, thinker, orator, researcher, choreographer, spiritualist, and a teacher besides being an acknowledged master of dance. She breathed her own brand of special artistry into both traditional art forms bringing in that special freshness to Bharatanatyam and Odissi at a time when both forms were emerging out of their old norms. Many honours have come her way-the Padma Vibhushan from the President of India, the Central Sangeet Natak Akademi Award and two honorary Doctorates from well known universities are only a few. About her holistic approach to dance Sonal says, "I try to assimilate in my performances, my exposure to other art traditions, stories and cultures of the world, the universality of the power inherent in each of them and use it as a major binding force." For instance, she picked on the theme of Mary Magdalene, weaving it into the Indian classical dance idiom and presented a deeply moving performance of love and compassion. Another example is her interpretation ofthe symbolic Kshana Vidya, the Ashta Chakras, the three Dhatus (kama, roopa and aroopa), all from Buddhist texts, beautifully narrated in a moving piece called Shoonya Mahari in Chariya or Oriya Prakrit. Sabari, the living energy within the individual, calls out to denounce the constant restlessness of the body and merge together in maha sukha (the great bliss). Sonal's depiction of Sabari who resides in the fourth loka among the seven lokas, draws on the great feminine force that pervades all of space. Her parallel training in Chhau, Hindustani and Carnatic music and deep Sanskrit studies contribute to the creation of several original works with intense philosophical insight, both in form and content. Some of her memorable choreographies include Jara, in which the hunter who is tormented after shooting an arrow at Lord Krishna in his final moments, has an emotional encounter with the Lord, and Draupadi a solo dance-theatrical production. Sonal?s on-going work with folk artists of different regions and workshop collaborations with the inmates of Tihar Jail in Delhi are some examples of her social commitment. A devi upaasika or a devotee of the Goddess, Sonal is a recipient of the Kameshwari Award of the Kaamakhya Temple in Assam. This award, which Sonal considers the highest and most important in her life and artistic career, is a unique and rare honour from the very source of the Goddess Mahashakti. It is this shakti that gave her the immense strength to overcome whatever challenges life threw in front of her.